Flights are so cheap in January. 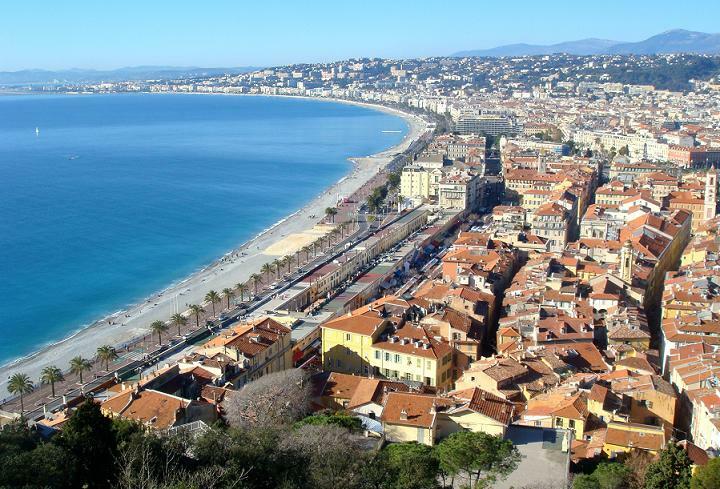 It only cost me £10 to buy an EasyJet flight from London to Nice, right in the heart of the Côte d'Azur, or French Riviera. I had just visited Florence the week before, and had already booked my trip to Munich the next weekend, so I thought I might be traveling too much, making three trips on three consecutive weekends. I felt that I might be neglecting London and my flatmates and my studies. However, I couldn't pass up the opportunity to escape the dreariness of London in January for the (hopefully) sunnier and warmer South of France. And I'm so glad I went. I flew from London on a Friday midday, not an early morning this time, so I was well-rested for the trip. This also meant that I essentially lost most of my first day. 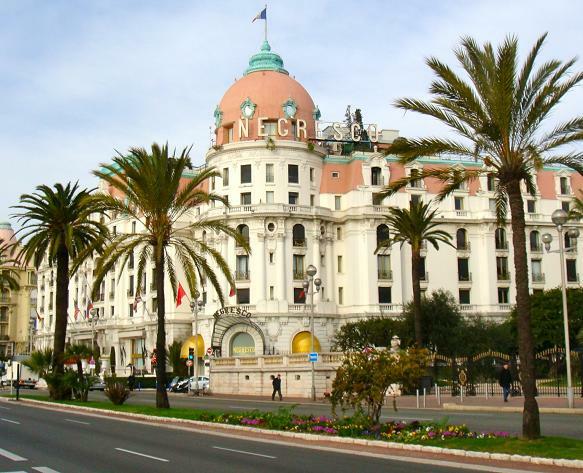 Not to worry - the flight was quick and I soon arrived at the Nice Côte d'Azur Airport, which is right on the waterfront and only a short bus ride away from Nice itself. The bus drove along the waterfront, the blue waters of the Mediterranean just outside the window. 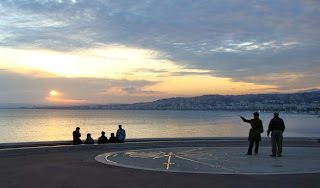 I arrived at the stop for my hostel, and strolled along the Promenade des Anglais. 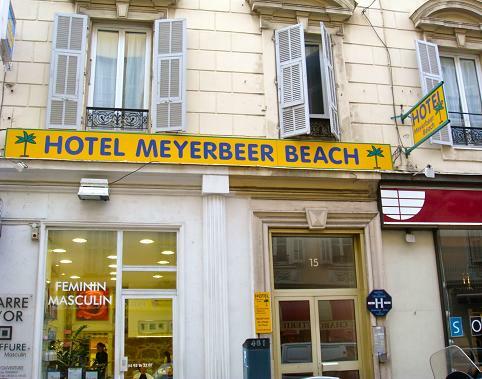 I checked into my hostel, the Hotel Meyerbeer, which is only two blocks from the beach and a ten minute walk to the center of Nice. The hostel itself is in an old building, though average by Niçoise standards. A narrow staircase led me upstairs to a small reception area with a breakfast table and internet access; then up one more level, down a couple of narrow hallways, and I arrived in my shared room with four beds. The bathroom was small with tile floors. All in all, it's an acceptable hostel, nothing noticeably dirty or stinky. It was already 4:30 PM, so I set off to make the most of what was left of the day. I walked to the waterfront, and I strolled along the street, where every building has a cafe or two or three. The cafe is a fundamentally important part of French life, much like the fast food restaurant for the U.S. 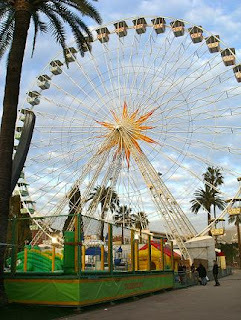 However, I couldn't bring myself to spend €3.50 for a coffee or €7 for a sandwich and just sit around for an hour or two. I couldn't spare the time nor the Euros! So I kept walking. The beach was not warm and sandy, as I had imagined. Instead, it was rocky and pebbly, like the beaches at Dover and Brighton. Is there no sand in Europe? I guess the stony beach is the reason why every summertime picture of the French Rivera shows the beach filled with people sitting in beach chairs. No sandcastles here. The weather was cool, but not as chilly as London. 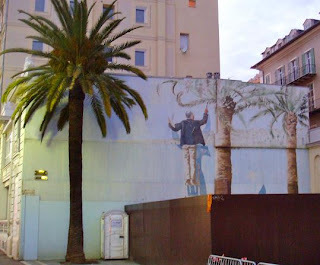 The Mediterranean climate and flora momentarily made me feel like I was back in California. But soon, the French architecture and narrow medieval streets then reminded me that I was 6000 miles away. 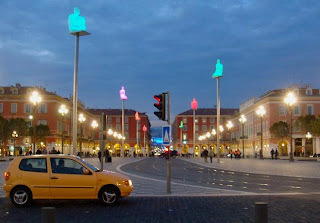 I walked toward the center of town, the Place Masséna, which is a large plaza connected to the Promenade by the Jardin Albert Ier. 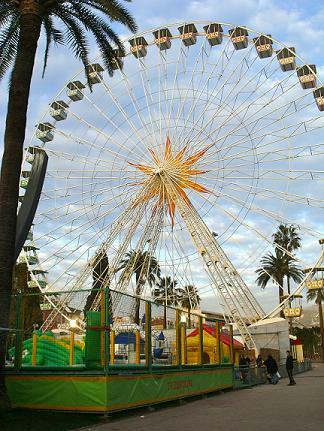 Palm trees were a sight to behold! I continued to walk around the city that night, taking in the buildings and people along the promenade. I had dinner by myself at a restaurant that looked half Americanized. I continued to walk around the city, heading eventually as far as the train station to the north. I felt like people were staring at me for some reason as I passed them, and it didn't take long for my astute observational powers to see the reason why: I was the only one who wasn't smoking a cigarette. Well, when in France, eh? I found a small tobacco shop toward my hostel and got myself a cigarette and lighter. And voila! No more stares as I strolled the city at night. Saturday morning, and I woke up easily. The hostel room was neither the cleanest nor the most spacious, but I slept well. There was a girl sleeping on the other bed; she was quiet and said hardly a word to me. She just lay there, reading her book. 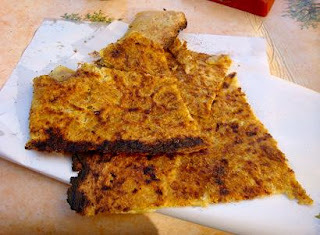 Socca - a Niçoise specialty. After checking out the street market, I walked up the nearby hill, formerly home to a castle. 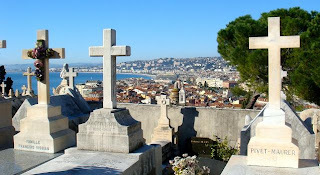 I discovered a cemetery with quite the view. And further up, I could tell that the views would get even better. The weather was certainly perfect - sunny and brilliantly warm. Breathtaking. Absolutely goregeous. I spent several minutes just taking it all in. Well, then it was time to go to Monaco! Let's go! I returned to Nice, somewhat exhausted but still excited to see as much as I could. The Saturday night beckoned, and I heeded its call. 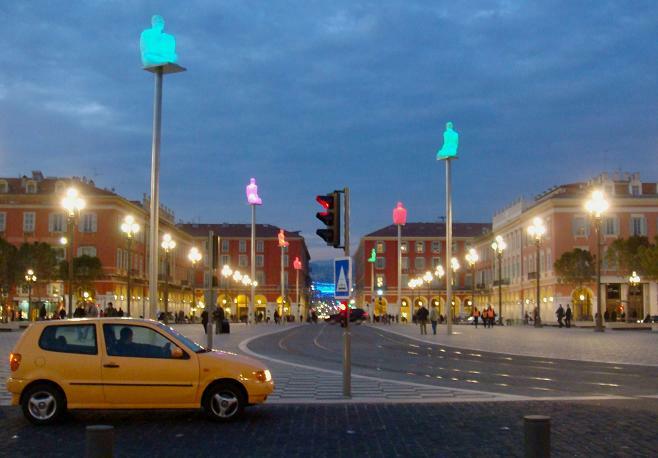 The Place Masséna lights up at night. 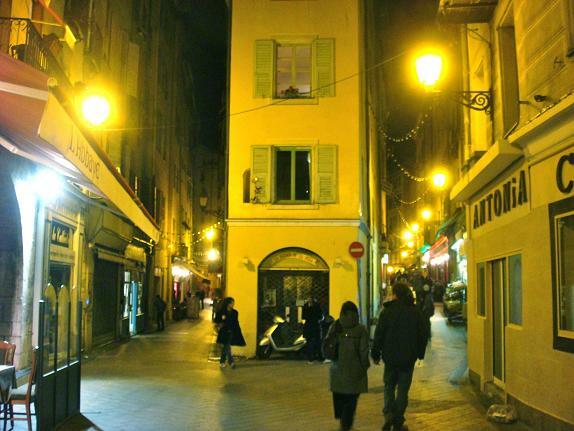 Walking through the narrow streets of old town Nice, I kept looking for someplace to eat. I eventually found La Maison de la Pizza. It was awkward to eat there by myself, especially since there was an older couple at the next table who ate and drank wine and conversed for the entire two hours that I was there. The owner even came over and sat with them. Meanwhile, I was there, slowly munching on my personal pizza because I knew that the French don't do fast dining. Sunday, my final day on the Côte d'Azur. I needed breakfast, and I had to do it the French way. So, partially ignorant, I walked into a bakery and bought a baguette. 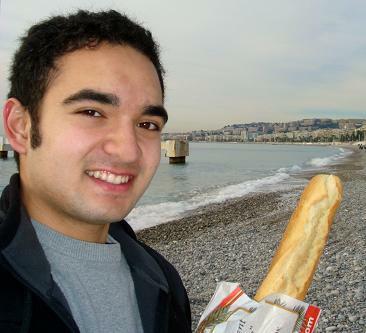 There were plenty of other people just walking around randomly with baguettes, I thought, so I might as well join in. 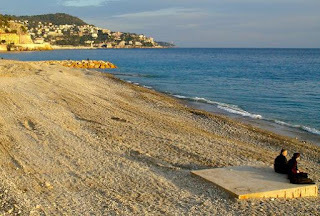 Such was my breakfast: A baguette on the beach. Some of the most beautiful scenery I have seen so far in Europe.